Good morning my crafty friends! 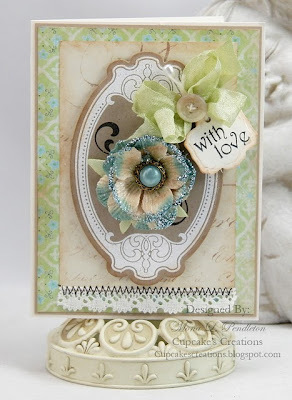 Today it is my turn to post a project over at the Celebrate the Occasion Challenge blog! The challenge is to make a card for any occasion using white, green and 1 other color of your choice. Head on over to join in the fun! A winner will be selected and entered into CTO's monthly drawing. March's prize will be the Rock Princess cricut cartridge!! I used Petal Pink Crinkle Ribbon to tie the pretty bow and to make the border across the bottom of the card. The border punch is the Martha Stewart doily lace, and I used a small paper doily. All of the patterned card stock is from Crate Paper. "Mr & Mrs" comes from the Sweethearts cartridge and was cut at 2.18 inches (gypsy). The background is from Gypsy wanderings and the green layer was cut at 3.21 x 3.08 inches and the white layer was cut at 2.96 x 2.84 inches. Prima Flowers on your Gypsy & FCCB spotlight! I think the thinner the card stock, the better this works! I used Bazzill on the yellow flower, Provo Craft on the pink and a thin linen type card stock on the white flower. Let me know if any of you come up with the 'perfect' paper for making these little flowers! White flower on Raspberry Truffle Crinkle Ribbon. Yellow flower on Raspberry Truffle Crinkle Ribbon. These are the supplies I used: Mother's Day Bouquet cartridge, Gypsy, Quick Dry Tacky Glue, Dry Emboss Tool, Paper Piercer and an upside down mouse pad for embossing the flowers. 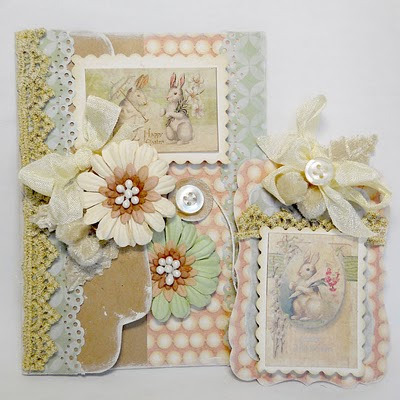 Anabelle, over at Bits and Pieces made this beautiful vintage card and tag set! Aren't the colors gorgeous?!?! She used Crinkle Ribbon and lots of other fun embellishments. Head on over to her blog for more pictures and details. Birthday Bash - Have a Happy Birthday! I am excited to have been chosen to be on the Design Team for a fun new challenge blog (started just this month), Celebrate the Occasion!! Be sure to join in for a new challenge every Tuesday! Here is my project for this weeks challenge! I love the Birthday Bash cartridge and used to make this fun shape card. The cake card was cut at 5 inches and the happy puppy was cut at 3.45 inches on my Gypsy with all of its fun layers. The stamped sentiment is from My Pink Stamper and of course I had to cover it with Glossy Accents! The paper is all Paper Crate and I have used lots of ink to make everything Pop! Speaking of Pop, the dog is attached to the cake with 2 Pop it squares, one under the head and one on the leg. Have a wonderful day and be sure to head on over to Celebrate the Occasion to meet the rest of the design team and see their fun Birthday projects! I Hope you get to spend the day with people you love! I used glossy accents on the couple and on the "kiss me" cuts. The swirled background is a cuttlebug folder and the red heart is covered with ladybug red flocking (Martha Stewart). I wanted all of the black pieces to stand out, so I used Pop-its dimensionals. 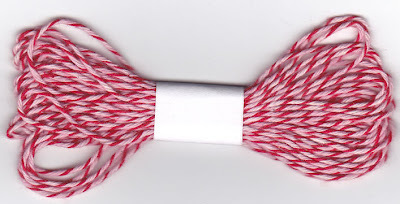 I used Cherry Red Bakers Twine and Scarlet Crinkle Ribbon. Here is a video showing how I made this card. Hope you enjoy it! 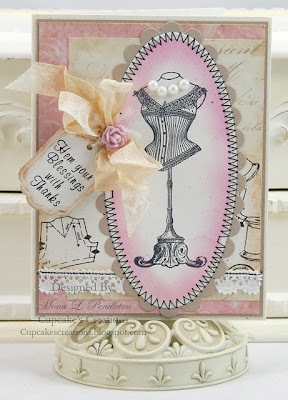 Mona Pendleton over at Cupcake Creations made this beautiful card using Vanilla Bean Crinkle Ribbon. Isn't it beautiful? She ties such lovely bows! Click here to see more pictures of this beautiful card. 2 new cards using Bakers Twine! For the first card I used Cherry Red Bakers Twine. I wrapped the bakers twine around the card center 2 times and then tied the bow around both pieces. Isn't it bright and cheerful? The papers I used were all Crate paper. The stamped sentiment is from My Pink Stamper. The card base was cut on my Gypsy at 9.22 W x 4.49 H from the Birthday Bash cartridge. I LOVE this cartridge! It has so many fun cuts on it! The adorable bird is also from the Birthday Bash cartridge. I cut the bird and all of its accessories at 3 inches. I used Vintage Chocolate Bakers Twine on this fun card. The overall card measurements are 5 1/2 x 5 1/2, all of the paper is from Crate Paper, and the stamped sentiment is from My Pink Stamper. I love the brown tones in this Bakers Twine!! It matches this card perfectly! The laundry wash board and bucket came from the Country Life cartridge (cut at 3 inches) and then I added some white gel pen doodling to the bubbles. I also inked everything with Ranger Tea Dye distress ink. I put the eyelets on and strung the bakers twine through the top piece of patterned cardstock before I adhered it to my card base. That way the inside of the card is 'clean'. I made this ruffle with Pine Cone Crinkle Ribbon. I first cut a strip of cardstock 5 1/2 x 1/4 inches. Then used my ATG gun to lay down a strip of adhesive covering the whole strip of cardstock. Next, I just pushed the ribbon into the adhesive as I 'gathered' it. Super easy, no sewing involved! I tucked the ends under on each side. The ribbon is wider than the cardstock strip, so it hangs over the edge and looks like it has been gathered. The ribbon you choose makes a big difference with this technique! Crinkle ribbon is thin and easy to work with! Introducing - VINTAGE BAKERS TWINE!!!! I have added Traditional Bakers Twine and Vintage Bakers Twine to My Craft Spot! Click HERE to see more price options for the spools. You can purchase spools separately for $4.99 each! 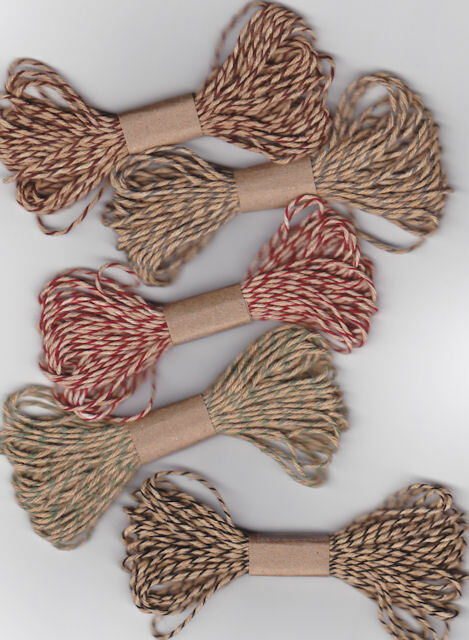 FREE with your Bakers Twine purchase over $15.00 until February 15th! Check back tomorrow for some fun cards using Bakers Twine!! Mona Pendleton over at Cupcake Creations made this beautiful card using Spring Moss Crinkle Ribbon. Isn't it gorgeous? 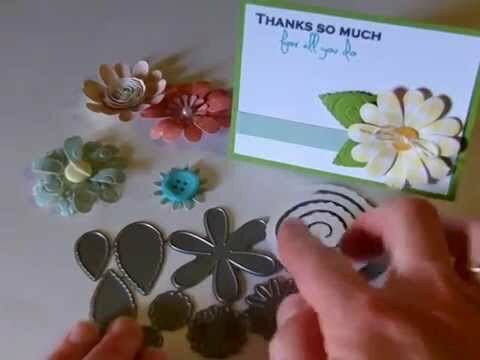 Click here to see a supply list and more pictures of Mona's beautiful card and explore her amazing blog!